Yet again kbmMW continues to set the bar for what an n-tier product must be capable of in the real world! Huge number of new features and improvements! New Smart services and clients for very easy publication of functionality and use from clients and REST aware systems without any boilerplate code. New high quality random functions. New high quality pronouncable password generators. New support for YAML, BSON, Messagepack in addition to JSON and XML. New Object Notation framework which JSON, YAML, BSON and Messagepack is directly based on, making very easy conversion between these formats and also XML which now also supports the object notation framework. Lots of new object marshalling improvements, including support for marshalling native Delphi objects to and from YAML, BSON and Messagepack in addition to JSON and XML. New LogFormatter support making it possible to customize actual logoutput format. CORS support in REST/HTML services. Focus on central performance improvements. Pre XE2 compilers no longer officially supported. Professional and Enterprise Edition is available for all with a current active SAU. If your SAU has run out, please visit our shop to extend it with another 12 months. * Officially now only supporting XE2 and forward. Support for pre XE2 may not be complete. pre XE2 may not be complete. cases that will mean the IP address without the port number. output. Its the default used log formatter. only datetime, type (info/warning/error/fatal etc) and log string. value should be different from its presented name. that contains a capacity constructor argument. Schedule methods, but sets Occurs to mwsoRun. record if key is null. SendAsyncRequestEx in kbmMWClient.pas (WIB only). which all are based on TkbmMWONCustomObject. via LoadFromObjectNotation and SaveToObjectNotation functions. can switch to TMonitor for reader/writer fair support. to prevent potential login spam. useful for high performance RESTful applications. setting the UTC value of an already defined TkbmMWDateTime record. marshalled or unmarshalled, or it should be silently skipped. TkbmMWCustomHTTPService and descendants. (OnCORS event). transport is used for smart services. getting rid of defunct/cached but unused AMQP channels. since its now controlled by the log formatter. 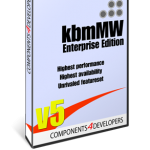 ← Teaser: kbmMW safety first… Random numbers and great passwords!